Coco: Desperate to somehow clamber up my legs to get over the wooden fence to play with the little girl next door, she was oblivious to the fact that she was trampling my new strawberry and blueberry shrubs in the little Tuscan barrel I picked up from the local hardware store. 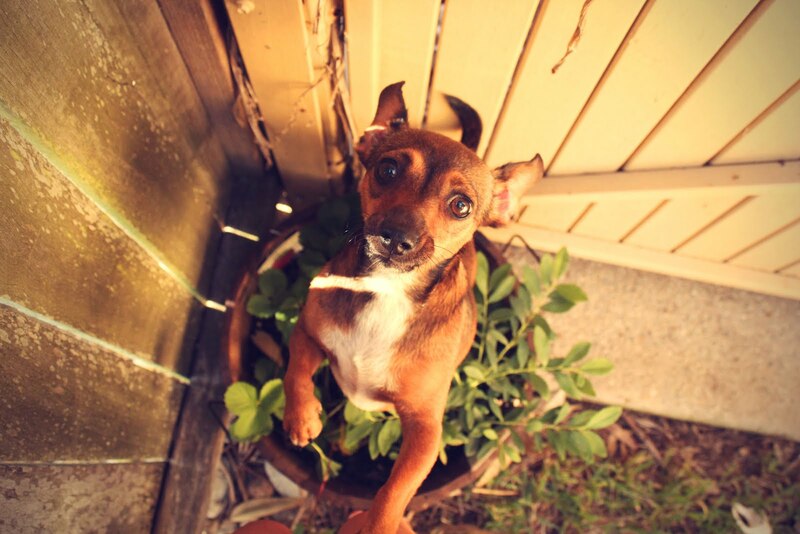 That's the thing with puppies, you make excuses for them in all their cuteness, no matter the plant casualties. It didn't matter that I was outside with her and giving her my full attention. All that mattered to little Coco was that at this very moment, the friendly eight year old girl next door had just stepped off the school bus and was playing with Maxi cat over that impossible divide. The Everest of backyard fences. I have fallen in love with this little nutmeg coloured ball of seemingly endless puppy energy. She's already a favourite little companion, along with Maxi. And it's ok, the blueberries will need to be repotted anyway. What a sweet click...coco is cute!!! Aw - new puppy! (Be still my heart) Puppies are forgiven all things... well most things! I love your description of her as nutmeg coloured! Her name was very nearly 'Nutmeg', except that she responded to Coco. Occasionally we call her Coconutty, or Nutty for short (that way I'm reminded of Nutmeg and her almost name). Thank you for your sweet comment Kirsty.